Sequences and patterns are found in many different parts of life, from the repeating patterns found in nature to the patterns in your daily routines. Patterning is an important concept for young children to develop, as it gives them the ability to better understand the world around them. It’s also a critical building block in mathematical reasoning; the study of patterns is a key part in mastering algebra. There are many ways you can teach kids to identify patterns, one of which is through pattern recognition worksheets. But instead of good old printed sheets, today I want to introduce you to a more interactive alternative: Puzzlecopters. Made by indie developer Hoglet Studio, it’s a fun collection of games where kids must complete various pattern sequences of different shapes and colors. Puzzlecopters offers four different mini games that focus on completing pattern sequences. Each mini game has six levels that vary in difficulty and contain randomly generated sequences. Additionally, there’s a bonus game where kids can create fruit smoothies for the game’s characters. You can choose any game you like, but if your child is only beginning to learn about patterning I suggest starting out with the Blocks game. It is, in my opinion, the easiest among the four games. In this game, kids must recreate a tower out of blocks with symbol. They must first find the bees that carry the blocks they need, then stack each block in the correct sequence. The second game is called Sea World. As you might have guessed from its name, it’s a sea-themed puzzle where kids attempt fill the gaps in a horizontal sequence with the correct pictures of sea creatures. Worry not as shadowed pictures in the sequence will guide them along. There are three types of sequences involved in this game: ABABABAB, ABCABCAB, and ABCDABCD. The third game is called Glasses, and it focuses on repeating color sequences. There will be a series of unicycles at the bottom of the screen and flying juice glasses at the top. Kids must drag the correct colored glasses to complete the sequence. The fourth game, Choo-Choo World, is perhaps the most challenging of all. 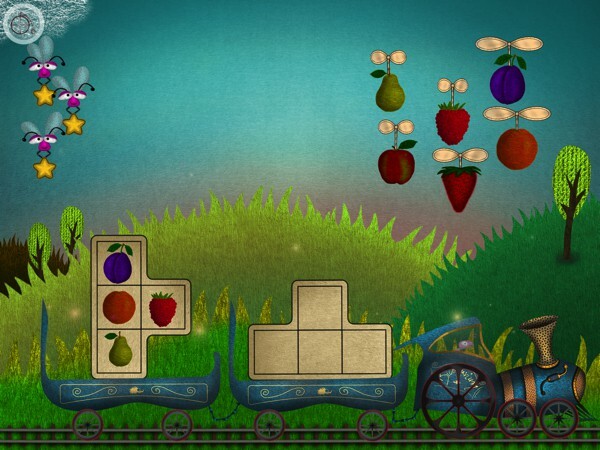 A train can be seen loading a Tetris-like shape, which kids must fill with the correct fruits. This particular game involves spatial awareness as the blank shape does not always match the reference image orientation-wise. If necessary, you can rotate the shape with your fingers to help younger kids complete the challenge. The train will then depart for the juice-making station where kids unload the fruits in the order shown on the uniquely-shaped machine. The bonus game is a free-play activity where kids can serve colorful fruit smoothies for the game’s mascots. It involves mixing the juices in two separate glasses, adding the ice cubes in unique shapes, putting stickers onto the glasses, and finally serving the drinks. It should be noted that kids can earn up to three stars in each level (except for the bonus game). They lose one star for each mistake that they make during their attempt to complete a sequence. It’s possible to repeat a level many times to get the most number of stars. It is the default setting of the game that you are to complete one level at a time. But, if you prefer to have all the levels unlocked from the beginning, you can specify this setting from the parents’ section. I also suggest that you check out the Game Guide included in this section, as it explains the game mechanics and points out all the hidden interactive spots in the games. The app is designed for kids ages 3-6. No reading is necessary to play. There isn’t a timer or a replay limit for each level, so kids can take their time to complete the game. The app has all the safety features you would want in a children’s app: no ads, no in-app purchases, and all external links hidden in the secured parents’ section. It doesn’t require Internet connection either. At the time of this review, the app is available for iPad only. Puzzlecopters features a quirky world filled with colorful characters. I love the earthy color palette and the organic sceneries. There are many little details that make the app amusing to use. For example, in the Glasses game you can swipe on the row of unicycles to make a tune. In Choo-Choo World, you can tap on the clouds to make it rain and on the trees to see their leaves fall. You can also blow into the microphone or tilt the iPad to influence the world’s physics. Although the topic of the app is common (sequencing), the mini games are unique. I especially enjoy the train game as I have never seen that kind of game mechanic implemented anywhere else. The other games are just as well done, and I can see them adapted into real-world activities to extend the learning opportunity. My only wish is that there will be more games and/or levels in the future! You can use the games provided in the app for inspiration to extend your child’s learning off screen. Using things found around the house, you can create your own sequences and patterns for your child to complete. You can use toy blocks to replicate the Blocks game (wooden or Lego blocks would work fine). Similarly, you can use flash cards to recreate the sequences found in the Sea World game. If you want, you can sneak in healthy eating into the game! Pour fresh fruit and veggie juices in small plastic cups to recreate the Glasses game. After your child has completed the puzzle, tell her to drink the juice in sequence as well! You can also use small pieces of fruit instead — cut them into shapes using a cookie cutter if you want to be extra fancy! Puzzlecopters is a sequencing puzzle game that combines whimsical graphics and a unique gameplay to help preschoolers learn about pattern matching and develop logical thinking. Although it only has 24 levels combined, it randomly generates the sequences used in the gameplay so it still has great replay value. Recommended for ages 3-6. Hoglet Studio is a small, family design house located in Poland. Puzzlecopters is their debut production. Their goal is to create original, fresh and high-quality apps for kids with both educational and entertainment value.